What’s Your City’s Daytime Population? Every day, roughly a million people in the Kansas City region wake up and head off to work. Quite often they will spend their workday in a different city, county, or even — somewhat unique to Kansas City —another state. This commuting can make the daytime populations of our cities quite different from our evening populations. Take the city of North Kansas City, for instance. North Kansas City is home to 4,270 residents (according to the five-year American Community Survey), but during a typical workday, its population swells as more than 20,000 workers commute into the city. These workers, combined with the residents who remain in the city during the day, give North Kansas City a daytime population of nearly 23,000. That’s a ratio of 5.37 to 1 (daytime population to residential population). North Kansas City is a unique case, with a relatively small population base and a number of major employers (Cerner, North Kansas City Hospital and Harrah’s) within its city limits. No other metro city with at least 1,000 residents comes close to that ratio. The chart below shows the ratio of daytime population to resident population for the larger cities (those with residential populations greater than 12,000) in the Kansas City metro. 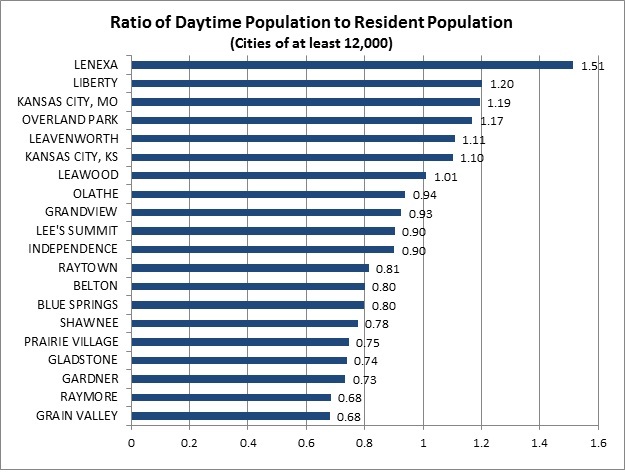 Lenexa, Kan., with a large business park in the southeast part of the city, has the greatest ratio between daytime and residential populations (1.5 to 1) for large cities, followed by Liberty, Mo. ; Kansas City, Mo. ; and Overland Park Kan.
On the other end of the spectrum are Grain Valley, Raymore and Gardner. These cities are all experiencing significant population growth, but most of their employed residents work in other cities. Need more information? Data for all cities in the metro can be seen here.